Minor is the lowest rank attainable in the Jiralhanae military ranking system in the Covenant. The Jiralhanae who have this rank are the most inexperienced in the Covenant. Minors are the least experienced Jiralhanae serving in the Covenant military, and as such they rate the weakest armor and shields and typically possess the least endurance. Among the Covenant, the Minors make up the largest contingency of heavy-ground forces for the Covenant after the Great Schism. They are often relatively weak for a Jiralhanae, and lack complete protective armor. The strength of Jiralhanae Minors usually comes from their sheer numbers. Newly recruited Minors often compete for their armor, gear, and postings. During the Fall of Reach, some Minors were equipped with blue helmets and minimal, non-powered armor. Another armor configuration that was used by Minors, particularly those serving under the Chieftain Tartarus, was composed of an ammunition bandolier, upper arm braces, and metal held between the toes by leather wrapping. This configuration was also sporadically equipped with a small helmet which covered the top of the head and extended over the face, but left the sides and back exposed, unlike the wraparound helmet used by the Jiralhanae Minor contingents at Reach. When the Jiralhanae became the dominant military force of the Covenant during the events of the Great Schism, Minors were given heavier cyan Jiralhanae power armor, but still lacked the shoulder pads, knee pads, and ankle armor of the higher ranks. Jiralhanae Minors are armed with a large assortment of weapons, including Type-2 spike grenades, Type-25 spikers, Type-25 Brute plasma rifles, Type-33 fuel rod guns, Type-50 concussion rifles, Type-51 carbines, Type-51 plasma repeaters, and Type-52 Maulers. Minors are also sometimes equipped with deployable covers for additional cover and armor lock. Unlike the Jiralhanae Majors, the Minors are equipped with limited armor, offering little to no protection against opposing combatants. They can be easily dispatched by removing their helmets with one or two shots, followed with a quick one headshot. Otherwise, it will take an unnecessary amount of firepower to kill them due to their "bullet-sponge" trait. Jiralhanae Minors often make tactical errors, such as standing in one place while firing or rushing forward into enemy fire, which can be used to one's advantage. They fire in shorter bursts and have somewhat less accuracy and lower rate of fire. They usually wield Covenant carbines or Brute plasma rifles. Unlike its Halo 2 version, the Jiralhanae Minor in Halo 3 sports cyan-colored power armor. The basic armor has no energy shielding like those used by higher ranking counterparts, and the armor falls apart when it receives too much damage. They are observed to be using Type-25 spikers, and occasionally Type-51 carbines or Type-25 plasma rifles. Jiralhanae Minors are never encountered alone, typically attacking in packs of four to six at once under the command of a Jiralhanae Captain. On the Heroic difficulty, they can withstand about 24 assault rifle bullets or 13-16 plasma rifle bolts; 7 bullets or 4 plasma bolts to drop their shield, and an additional 17 bullets or 9-12 plasma bolts to kill them; or 2 melees. Halo: Reach's Jiralhanae Minors more closely resemble Halo 2's Jiralhanae Minors in terms of gameplay; they do not possess power armor or any form of shielding, they sport a helmet that protects them from two headshots before falling off, and have "bullet-sponge" traits. Minors will normally wield spikers or plasma repeaters, and are often found in groups of 3-5, led by a Captain. They have access to armor lock, activating the armor ability when they have been hit a few times, particularly by Needler rounds, or after losing their helmet. 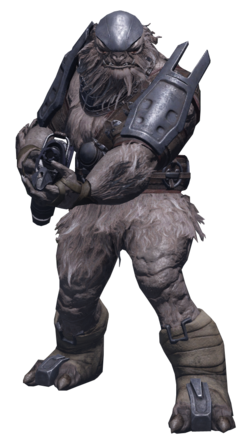 Brutes also posess the tendency to armor lock when grenades are tossed at them, and can therefore sometimes save themselves from death. When any other Jiralhanae rank gets infected by the Flood, its armor turns into the armor of a Minor. This rank has frequently been used erroneously to identify Jiralhanae wearing complete Power Armor in marketing campaigns and videos like Halo: Landfall, Believe, and We Are ODST, which is often gray in coloration. This rank has even been applied to a Jiralhanae wearing Stalker-type Power Armor. The Halo Encyclopedia erroneously replaces an image of a Jiralhanae Minor with a Major. An early model of a Jiralhanae Minor for Halo 2: Anniversary. An early, hairless model of a Jiralhanae Minor for Halo 2: Anniversary. A finished model of a Jiralhanae Minor for Halo 2: Anniversary. A Jiralhanae Minor in Halo 2. Two Jiralhanae attacking with Type-25 spikers in Halo: Last One Standing. A Jiralhanae Minor in Halo 3. A Jiralhanae Minor in Halo 3 . Concept art of the Jiralhanae Minor in Halo: Reach. A Jiralhanae Minor in Halo: Reach. Pattern on the Minor armor in Halo: Reach. Jiralhanae Minors engaging Sangheili during the Great Schism.